Hydrangeas are pretty hardy but if you want a larger one that will thrive in zone 4, choose the Panicle Hydrangea. The flowers on this species is a bit of a different. I am used to the round, puffy flowers that grow on my shrub, which is of the Mophead variety, but the Panicle hydrangea has flowers that grow to a long pointed shape – or panicle. 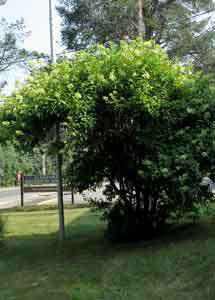 As you can see in the picture I have added from Wikipedia, the Panicle hydrangea also grows to be quite large. In fact if can be 15 feet tall so consider it to be more like a small, flowering tree. The flowers can be a foot long or more! The Oakleaf hydrangea grows similar looking flowers that are very long. You can tell the difference between these two by the leaves on the Oakleaf that are shaped like…. oak leaves! The flowers can be white or pink, but no blue on these larger varieties (as far as I know), but beautiful just the same. This species – the Panicle – will tolerate lots of sun. As it grows, trim out the lower branches and create a little tree of blooms.